Excerpted from D. Kim Rossmo. (2000). Geographic profiling. Boca Raton, FL: CRC Press. Peak areas of geographic profile (marked in orange) on a period map with the murder locations marked by the red dots. Little is known about Jack the Ripper beyond his handiwork. And no one knows for certain what motivated him. But he was, in a macabre way, a man for his times. The turmoil of the Industrial Revolution in Britain upset the standard social order, generating new ambitions, conflicts, and frustrations. Urbanization, crowding, and change led to anomie and the creation of the alienated loner. Harsh and inhumane conditions, an indifference towards children, and a savage lifestyle all conspired to create an environment conducive to violence and sexual deviance. It is not surprising the psychological and social infrastructures of the nineteenth century produced the first modern serial killer. The first canonical murder took place on Bank Holiday, Friday, August 31, 1888, in Buck’s Row. The victim was Polly Nichols, a 42-year-old alcoholic with grey hair and five missing front teeth. She had five children from a broken marriage. The Ripper cut her throat from ear to ear, back to the vertebrae, and sliced open her abdomen from pelvis to stomach. The next killing took place in a yard at No. 29 Hanbury Street, on Saturday, September 8, 1888. Annie Chapman was 45 years of age, stout, pugnacious, and missing two of her front teeth. An alcoholic, she was separated from her husband and two children, one of them a cripple. She was found with her neck cut so deeply it appeared as if an attempt had been made to take off her head. Her abdomen was laid open and her intestines placed on her shoulder. Parts of her organs had been removed. On Sunday, September 30, 1988, a double murder occurred. The Ripper first attacked Elizabeth Stride in a courtyard next to the International Working Men’s Educational Club on Berner Street. Stride was a 45-year-old alcoholic missing her front teeth and the roof of her mouth. She bore nine children, but claimed her husband and two offspring had perished in a steamboat disaster. The Ripper had cut her throat, severing the windpipe. The mutilation was minimal as he was interrupted by a carriage entering the courtyard. Within the hour a second body was discovered in Mitre Square, in the City of London. Catherine Eddowes, 43 years, was, like her fellow victims, an alcoholic with a broken marriage. She carried all her worldly possessions in her pockets. Her throat was deeply cut, and her abdomen laid open from breast downwards, the entrails “flung in a heap about her neck.” Her ear was almost cut off and a kidney taken, the latter apparently later mailed to the authorities. The final and most horrific murder occurred in 13 Miller’s Court, on Friday, November 9, 1888. Mary Kelly, only 20 years of age and three-months pregnant, was already a widow with alcohol problems. A bizarre sight greeted those who discovered her body. Her head and left arm were almost severed, her breasts and nose cut off, thighs and forehead skinned, entrails wrenched away, and her body parts piled on the bedside table. Jack the Ripper had all the time he needed to satiate his bizarre desires in Miller’s Court, and while debate continues on whether he was responsible for other prostitute murders that occurred around this time, most investigators believe he stopped, for whatever reason, after the mutilation of Mary Kelly (Wilson & Odell, 1987). The geographic concentration of the Ripper crimes has long made their “topography” of interest to researchers. The murders were all within a mile of each other, and the total hunting area was just over half a square mile in size. In 1998 a geographic profile was produced for the Jack the Ripper case based on body dump sites. The peak area of the geoprofile focused on the locale around Flower and Dean Street and Thrawl Street. Flower and Dean Street and Thrawl Street no longer exist as they used to, but in 1888 they lay between Commercial Street to the west and Brick Lane to the east, north of Whitechapel Road; during the time of the Whitechapel murders they contained several doss houses. Dorset Street lay less than two blocks to the north along Commercial Street. This was the vice-ridden neighbourhood that East End social reformers referred to as the “wicked quarter-mile” It appears that the notorious rookery played a key role in the Jack the Ripper mystery, and there is some supporting evidence for the geographic profile results. Polly Nichols used to reside at 18 Thrawl Street; just before her death she was evicted and moved into the White House at 56 Flower and Dean Street, a doss house that slept both men and women. Annie Chapman’s primary residence was Crossingham’s Common Lodging House at 35 Dorset Street. Elizabeth Stride occasionally lived in a common lodging house at No. 32 Flower and Dean Street, and reportedly was there the night of her murder. Catherine Eddowes usually stayed in Cooney’s Lodging House at No. 55 Flower and Dean Street, and had slept there two nights before her murder. Kelly lived and died in McCarthy’s Rents at 13 Miller’s Court, off Dorset Street (it was actually the back room of 26 Dorset Street, situated across the road from Crossingham’s Common Lodging House). She had previously resided in George Street, between “Flowery Dean” and Thrall Street. Kelly was seen picking up a man on Commercial Street between Thrall and Flower and Dean Streets the night of her murder. These residences were suspiciously close to each other, covering less than 1.5% of the total hunting area. It is difficult to assess the significance of this finding as the locale had a concentration of slum lodging houses where most Spitalfields Parish prostitutes lived at one time or another. These women were also highly transient. Two blocks north of Flower and Dean Street was the Ten Bells Pub (now known as the Jack the Ripper Public House) on Church Street and Commercial Street, across from Spitalfields Market; all the Ripper victims were known to have drank here. 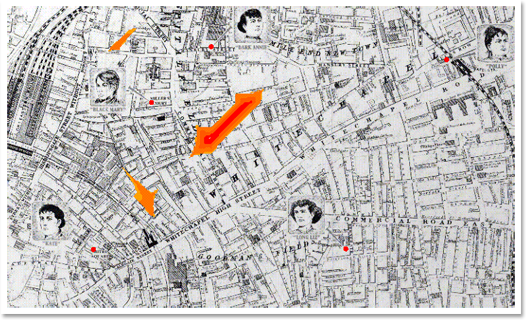 Possibly Whitechapel Road and Commercial Street/Road were arterial routes used by the killer. This location, between Mitre Square and Flower and Dean Street, is on the likely route home if Jack the Ripper indeed lived in the infamous “wicked quarter-mile.” Some police theorized at the time the Ripper’s route led to the vicinity of Flower and Dean Street, and others believed this should be the epicentre for their manhunt. While the geographic profile for the Whitechapel murders is interesting and has some supporting evidence, we cannot assess its accuracy. The killer’s address, like his identity, remains unknown.